“Oh, bright chimerical!” So began a very bad piece of verse, back when we wrote such things. Thankfully, the haze of age has obscured the rest of it. We imagine it was about some young lady or Anarchy or Idleness. It’s easier to believe passionately in such abstractions when one is young. Nowadays, we trade the warmth of youthful passion for the colder, subtler pleasures of offhanded obsession. This is a simple-looking box with nice lines. Holds together well. But it’s a chimera. In its ideal proportion, it supposes a grid that is based on a polygon inscribed inside the circle. That shouldn’t present a difficulty, but it does. Everything else I do has polygons outside the circle. The answer is like Poe’s Purloined Letter — it’s in plain sight, but I can’t see it. This would make an excellent point-of-sale container. Coffee beans, loose tea, Chinese take-out, whatever. Pressed out of paperboard, oh yeah. I ain’t letting no grid make a monkey out of me. 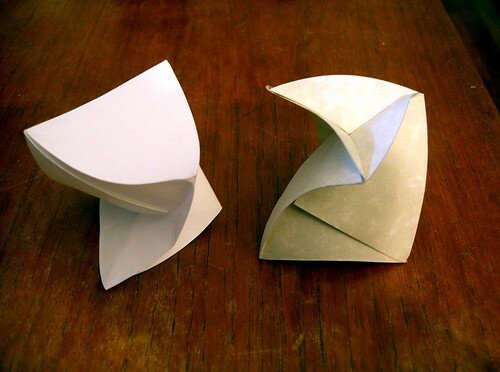 This entry was posted on Thursday, June 14th, 2007 at 6:26 pm	and is filed under circle, content, crease pattern, creative commons, curved surface, open source origami, tetrahedral. You can follow any responses to this entry through the RSS 2.0 feed. You can leave a response, or trackback from your own site. A propos de thé en vrac : j’en ai vu ce matin dans une boutique de luxe, vendu sous le nom de “thé des concubines”. Brilliant! Wakefulness is important, especially when the concubines are plural, as they are in this case. At work, I drink something similar, green and black and scented with cucumbers and peach. Sounds odd, but it’s quite tasty.